Average True Range (ATR) is tool commonly used by traders as a measure of volatility. ATR examines a recent period of price data and computes the average price range over that period. A higher ATR indicates higher volatility. 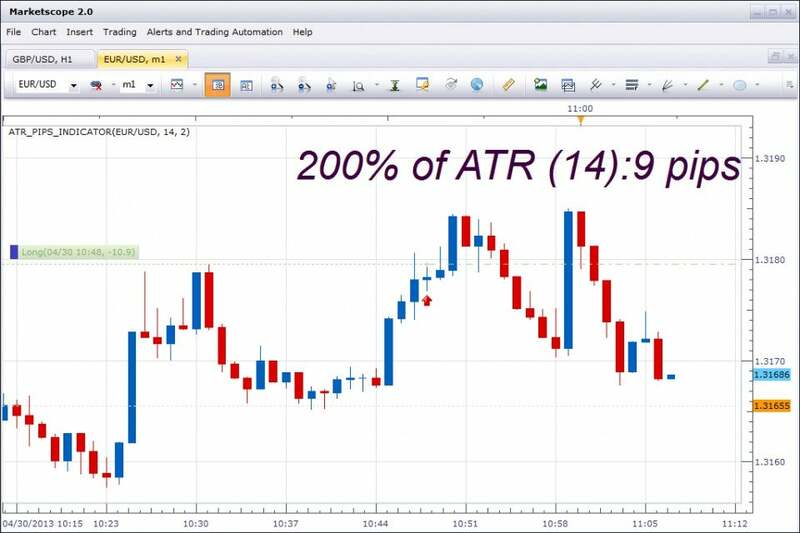 Traders often use the ATR to manually calculate where to set entry orders and where to place stops and limits. The ATR Pips Indicator makes these calculations for you, in real time, directly on the chart. Simply enter a multiple, the percentage of the ATR, and the ATR Pips Indicator will instantly show you the result in pips. Multiplier – The quantity by which the ATR will be multiplied, expressed in decimal form (e.g. 0.75 for 75%).